Would you understand your dog if it could talk? Does your cat understand you? These are the opening questions in the Norwegian book Å forstå dyr. Filosofi for hunde- og katteelskere by the Norwegian philosopher Lars Fr. Svendsen. Svendsen is professor of philosophy, well known for his books, translated into 29 languages: Ondskapens filosofi [A philosophy of evil], Ensomhetens filosofi [A philosophy of loneliness] and Kjedsomhetens filosofi [A philosophy of boredom]. The books are written for a wide audience. 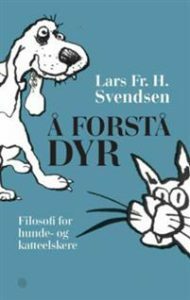 The title Å forstå dyr indicates that this book is no exception; it is governed by a love of animals – his own dog and cats. According to Svendsen, the book is primarily not about animals, but about humans, and of the opportunities humans have to understand animals (s. 8). The book takes the hermeneutic perspective, despite the fact that this tradition has undefined animals. Svendsen quotes Kant, Heidegger, Gadamer, Kafka and Wittgenstein, among others, and in a solid philosophical tradition he includes chapters on language, consciousness, reading thoughts, intelligence, the conception of time, loneliness, sorrow and morals. In addition, Svendsen argues from a scientific point of view, and from what he calls an amateur point of view, including in the latter his own personal experience living with his two cats and the dog Luna. Thus, he shifts between the professional way of arguing, and the position of somebody living with pets. Animal studies is an important topic in environmental studies, and Svendsen’s book addresses the curiosity raised about animal life in a broader environmental perspective. Svendsen takes the reader through discussions informed by philosophers and scientific knowledge: Do animals have language? It depends what you mean by language: “[D]e fleste forskere mener at aper ikke har språk, i det minste ikke hva lingvister vanligvis kaller språk». [Most researchers believe that monkeys do not have language, at least not what linguists usually call languages] (21). “Kan dyr føle ensomhet? Det avhenger av hvordan man definerer ensomhet». [Can animals feel loneliness? It depends on how you define loneliness] (146). The argumentation is ruled by categories and definitions, and the text establishes truths by categorizing, defining and discussing the category to which something belongs. Svendsen states that the amateur uses anthropomorphisms in his attempt to understand animals; for instance, he would say that his dog is “thinking of something”, that it is “jealous”, “sad” or “lonely”. However, many philosophers and scientists systematically try to avoid using such expressions (40), as the biologist tries to explain the animal rather than understand the animal. Of special interest to the NaChiLitCul research group is the way the book demonstrates how an anthropocentric perspective is embedded in the subject of philosophy itself. Svendsen is fully aware that the categories are human ruled; they are anthropocentric. Both the ways of raising questions, and the order in which the chapters are composed, reflect this anthropomorphism. The book starts by raising the question of what is language and consciousness, thereby demonstrating that animals are inferior to even small humans: “En menneskelig toåring klarer […] å bruke substantive, verb, preposisjoner og så videre på en grammatikalsk korrekt måte”. [A human two-year-old is […] able to use nouns, verbs, prepositions, and so on in a grammatically correct way] (19); and that «Ingen andre dyr har de språklige evnene som vi har”. [No other animals have the ability to use language that we have] (23). The hierarchy of species is part of the language itself: humans, monkeys, wolves, dogs, cats, insects and octopuses. Trees and plants are even lower in the hierarchy: “Enkelte vil hevde at trær og planter kommuniserer eller de til og med har spark, men da bruker de ordene i en så utvidet betydning at det ikke er noen grunn til å tilskrive trær og planter bevissthet av den grunn”. [Some would argue that trees and plants are able to communicate or even that they have language, but then they use the words in such an extended sense that there is no reason to assign trees and plants consciousness for that reason] (59). There are no neutral standards. Svendsen writes about animals being interpreters, animals being subjects. At the end of the book, there is a chapter about friendship, in which Svendsen refers to the famous lecture by Jacques Derrida: When animals look back. Nevertheless, it is interesting to note that the female philosophers Donna J. Haraway and Cynthia Willett are not on the reference list. Their When species meet (2008) and Interspecies ethics (2014) would have challenged the composition of the book, starting with their claim that animals and plants and humans do co-exist in a common environment. One of the premises of NaChiLitCul is that consciousness is built on the way words and texts define our view of the world. That is also relevant to remember when we read animal-loving male philosophy.